I’m a day late, but here is my French Fridays with Dorie recipe for the week. I was visiting my parents in Seattle last week, so they were the lucky recipients of this delicious dish. It was fun to take my photos with new props and a different location! 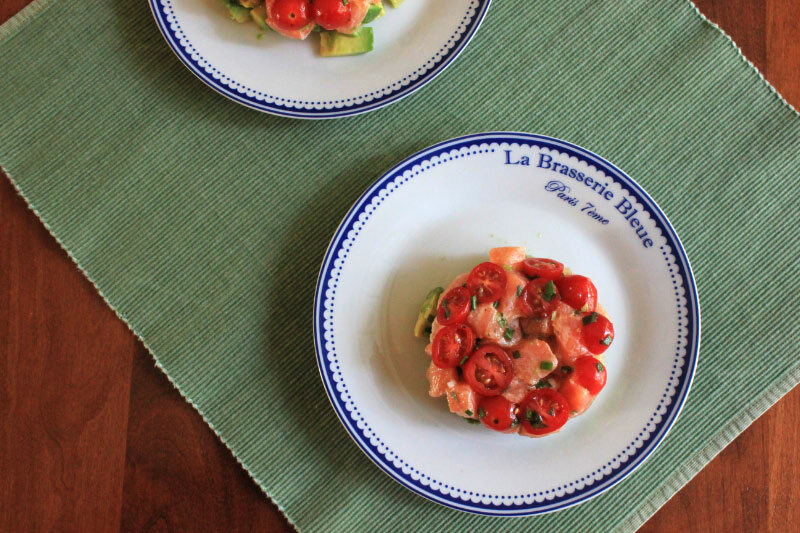 Salmon Tartare is a lovely dish made from raw salmon seasoned with lime, scallions, chives, mint, salt, pepper, and a splash of Tabasco. 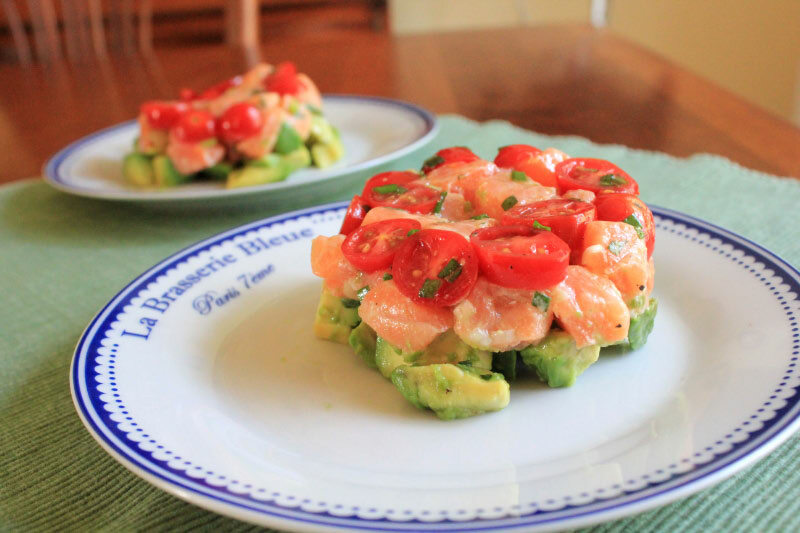 It is served on a bed of perfectly ripe avocado with similar seasonings, and topped with halved grape tomatoes. To add to the beautiful colors and presentation, Dorie has us layer the ingredients in a ring or ramekin (I used ramekins) for a structured look. This was a huge hit! My Dad said it was “Goooooood”! We enjoyed it with white wine on a beautiful, sunny afternoon. I loved the combination of flavors and textures. Having fresh ingredients is a must. A note on portion sizes: Dorie mentions that the portions are generous, so I cut the recipe in half. Even then, the portions for three of us were generous for a starter. I hope you are all having a nice weekend! I love those dinner plates, so pretty. Your tartare looks great, I am glad to hear you all enjoyed this recipe. I cut mine in half too 🙂 I love the plates and lucky you for getting to share such a fun dish with family! Well done that you noticed Dorie’s comments on the portions first. I did not and we had was too much! But since it was cooked, I had no issue leaving leftovers for the next day. I also cut the recipe in half. I really enjoyed this one…but I didn’t use fresh fish, I used lox. I just can’t eat raw fish! Love how pretty yours look! I cut it in half for two, and we were quite filled with this as our entire meal. I find that Dorie’s portions are generally generous. Things she says serves 4 can work for 3 filling meals rather than just 2. You were definitely in the right place for fresh salmon this week! I quartered the recipe and still had too much! Glad you had a nice time in Seattle and that your family enjoyed this week’s project!